For the first time since the beginning of its history, exactly 50 years ago, Comunicazioni Sociali devotes a special issue to Photography. For a long time, the study of photography has been a part of Art studies or a mere object of philosophical investigations. Yet, after the advent of digital technologies it progressively became central in Media and Communication studies. From the 2000s onwards, various social and technological events made photography more accessible, ubiquitous, public, cheap, democratic, immediate and shared than ever before, paving the way to a renewal of photographic experience. New objects, formats, devices, practices and uses emerged as specific traits of a ‘performative’ photographic agency. This emergence is allowed by the fact that photography, despite being one of the most ancient media, still shapes our lives, empowers our biological vision, and enhances our imaginative visual practices. The editors of this issue, Adriano D’Aloia and Francesco Parisi, propose the term ‘snapshot culture’ to refer to the combination of technological, aesthetic and practical shifts in contemporary photographic experience. Snapshot culture is characterized by a twofold dynamic: the persistence of the original traits of the photographic experience as it emerged and developed, coupled with the modulation of new opportunities offered by technological improvements and social changes. Indeed, the digitalization of photographic aesthetics and related media practices provides an ideal case for studying some of the most challenging developments in visual media aesthetics within the broader landscape of the post-medium condition and for reflecting on how photography theory has responded to such challenges in the post-theory era. This special issue offers a critical investigation of photography’s ‘persistence’ in the media experience through both an analysis of concrete objects and phenomena (e.g. selfies, animated GIFs, social networking, computational photography) and the refinement of theoretical approaches to photography. Per la prima volta nella sua storia, cominciata esattamente cinquant’anni fa, Comunicazioni Sociali dedica un intero monografico alla Fotografia. Lo studio della fotografia è stato a lungo appannaggio dell’ambito artistico-estetico, o tutt’al più oggetto strumentale di investigazioni filosofiche. Con l’avvento delle tecnologie digitali la fotografia ha invece guadagnato progressiva centralità negli studi sui media e sulla comunicazione. Dagli anni 2000 in avanti una serie di eventi sociali e tecnologici l’ha resa più accessibile, ubiqua, personale, economica, democratica, immediata e condivisa, e ha aperto la strada a una nuova esperienza fotografica. Nonostante sia uno dei più antichi media moderni, la fotografia continua oggi a dare visibilità e forma alle nostre vite, a potenziare la nostra visione biologica ed ad accrescere la nostra immaginazione visiva. I curatori di questo monografico introducono l’espressione “snapshot culture” per riferirsi al complesso dei mutamenti estetici e pratici dell’esperienza fotografica, con l’intento di evidenziarne gli aspetti rilevanti e innovativi, pur senza sottacere le ricadute problematiche. 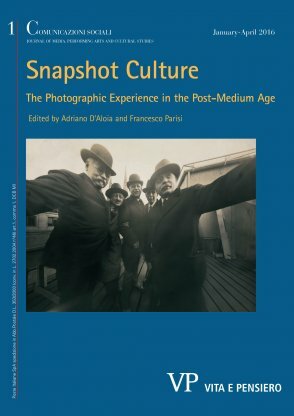 La “snapshot culture” è caratterizzata da una duplice dinamica: da un lato la persistenza dei tratti originari e costitutivi dell’esperienza fotografica, dall’altro la modulazione di nuove opportunità offerte dalle innovazioni tecnologiche e dai cambiamenti sociali, nello scenario di una più ampia “condizione post-mediale”. I contributi raccolti offrono un’esplorazione critica della “persistenza” della fotografia nell’esperienza contemporanea, sia attraverso l’analisi di oggetti e fenomeni concreti (dal selfie alla GIF animata, da Instagram alla fotografia computazionale…), sia attraverso la rilettura e la revisione degli approcci interpretativi finora utilizzati per comprenderla. Two successive phases in the advent of digital photography can be discerned. The first involved the digitisation of photographic production, which has become ubiquitous and portable, embedded in mobile phones – a socially legitimated practice in ordinary everyday life. That process demolishes ‘photographic intentionality’ and profoundly modifies the status of the image. The ontological distance between still and moving images blurs to almost nothing. Through an iconic turn, both still and moving images are increasingly challenging alphabetical media’s former absolute dominance in communication and thought. The second phase arrived with the digitisation of the broadcast forms of still and moving images and their immaterial delivery, coming together with social networking. It happened around 2006, when the 9/11 trauma began to subside and telecommunications networks started to improve again, becoming faster and able to transmit images effectively. The last decade has seen users come increasingly to the fore in developing and disseminating creative content. Much of the content has an iconic form and contributes to a particular hybrid aesthetics of user production. For their part, 20th century media agencies, which are almost totally digitised, have sought to transform themselves into social media. The result is a blended communication system: an integrated set of communication channels ranging from the social to the media/broadcast element. Within the contemporary communication system, the photographic act is highly adaptable and persistent. This article focuses on how techniques and aesthetics influenced the genesis of the ‘snapshot style’ in the late 19th century. Snapshot photography was to be seen as not just ‘technological painting’ but rather a means of establishing an aesthetic relationship with the world, a performative (yet autobiographical and individual) experience, a technological tool fostering a conceptual immersion in the perception of reality. This idea became useful in the transition to later developments in digital photography. It allows us to overcome the dualism of instant/truth vs. pose/fiction, which does not accurately represent the complexity of photographic practice, and to understand that it would be superficial to ascribe to the snapshot the responsibility of being a transmitter of truth. Rather, this contribution tackles the question in a non-stereotyped way by confirming photography’s specificity in the relational and performative nature of its practice. This specificity is a royal road to telling stories about the world, through instant shots or pose aesthetics according to individual authors’ poetics. The article concludes by focusing on the relationship between ‘selfie storytelling’ and artists’ attitude in the 1990s, when the private and participatory aspect became a hallmark, and the family album became a common symbolic reference. A comparison of two authors, Nan Goldin and Terry Richardson, serves to describe the transition from the desire to memorise a life through sharing a collection of images of family albums to experiencing a life by constructing an identity through images that can constantly be altered. This article takes some themes from the semiotic debate on photography and examines them in relation to some key issues of audiovisual intermediality. In his book L’image précaire, Jean-Marie Schaeffer discusses the medium’s nature in detail, emphasising two aspects: the concept of arché, the technical operation behind the photographic impression; and the communication context governing photography as a privileged vector for interpretation. Similarly, the fulcrum of interest in contemporary semiotics seems to have moved from textual objects to media practices and experiences. 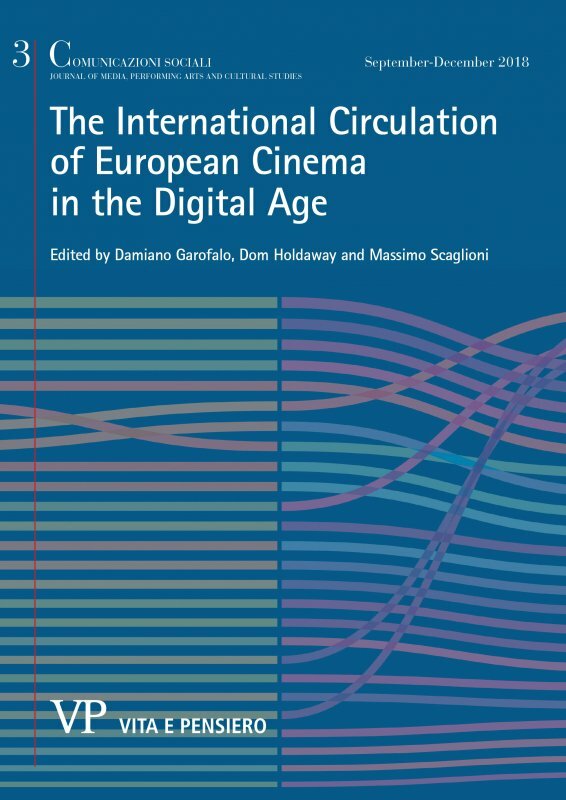 This contribution argues that, in the contemporary debate about overlapping boundaries between media, the gap between the audiovisual images’ material aspects – i.e. several definitions and dimensions of formats – is often used for rhetorical effect. These operations are based on the arché: the spectator inferentially projects the operation of capture devices to understand the audiovisual ‘discourse’. This contribution also discusses Francesco Casetti and Pietro Montani’s theory of intermediality. In his latest book, Casetti writes of a cinema of awareness, which uses ‘low-definition’ images to generate ‘high-definition’ thoughts. Montani proposes the concept of intermedial imagination, a technique that relies on the gaps between formats to push spectators to critically recompose such gaps. Both theories hinge on two central concepts: 1) the images’ format and 2) the discursive genres. To interpret these gaps critically, spectators must first be able to recognise a technical format or a typical frame. Starting from some cinematographic examples that exploit the ambiguity of photography, the essay seeks to extend such assumptions to audiovisual forms, in an attempt to establish a unified theory. Fandom is a term which refers to communities where people share the same interest in a cultural object and invest their emotions and their time in it. Within this scenario, fanarts contribute to feed fans passion, giving them a way to express their creativity. This contribution concerns the case of fiction picspam, a specific type of fanart that is particularly useful for creating new stories using screencaps from original audiovisual and visual products. The discussion will be accompanied by a more general analysis that illustrates what kind of picture a fanart is, by listing and briefly examining its different typologies. Finally, the powerful synthetic character of picspam will be highlighted, along with its efficiency in building alternative fictional universes. The quantity of images created and used has constantly grown in recent years. Numerous images and videos are shared and manipulated every second through social media as private yet public representations of contemporary culture. Despite the interesting role of such images, social and computer scientists alike are still looking for methods and tools for analysing this visual stream and for efficiently connecting visual analytics with their physical and contextualized meanings. Big visual data is a crucial challenge. It demands new research skills to intertwine computational data – numerous images, tags, places, likes, etc. – with qualitative data, such as the images’ context, users’ intentions, and the invisible audiences. This article analyses two large-scale studies that merged quantitative computational methods with qualitative ones: Phototrails.net and Selfiecities. net. Those studies used a multi-method approach to combine macro-analyses (e.g. of an entire city’s ‘urban visual style’) with micro-analyses (e.g. meanings and specificity of each photo in the sample). They also devised new information-display solutions, which provide both an innovative way of representing the results and a specific epistemological approach for interpreting them. Starting from these case studies, the paper focuses on a semi-automated methodology that codifies and analyses images from three different perspectives: authors, subjects and commenters. This method contributes to a significant new understanding of user-generated images as stratified, multi-perspective – and often conflictual – social representations. Hashtagging allows Instagram users to articulate individual photographic identities and experiences to larger cultural movements and histories. Photographs are a key medium of digital-native communication. As such, the desire to hashtag a photographic experience on Instagram highlights the evolving nature not only of the visual subject but also of the digital photograph itself. This paper explores how hashtagging allows visual subjects to heterotopically organise their conflated lived and digital experience in both personal and public histories through the panoptic nature of the social network. The Instagram self is an identity constructed simultaneously through the images in the user’s profile and other hashtagged photographs. Each publicly viewable hashtagged photograph becomes part of an individual’s social visibility that also commodifies them, allowing users to barter for panoptic recognition in an exchange of goods – visibility for likes – in which hashtagged photographs affirm the user’s visual subjectivity. In contemporary remembrance culture, the formally ‘ephemeral gestures’ of public memory become integrated into the body of the event’s afterlife through a combination of the caption-like hashtag and the illogical nature of the photograph’s temporality. Furthermore, the additional illogical temporality of the always-here Internet draws attention to the constant re-colonisation of meaning. The nature of visual subjectivity requires the double sensation of seeing and being seen. Contemporary remembrance culture seeks to establish this ‘double-sighted’ construction of the subject as the means to construct the public space, an inherently heterotopic space. We can conceive of the personal Instagram profile as a modern heterotopic museum in a non-place and non-time. Through photographs’ heterotopic nature, with their amnesia of time and space, not only do we archive ourselves but we also enter the archive of culture via hashtags. In popular culture, particularly on news websites and blogs, the umbrella term ‘death selfie’ covers several selfie practices without further linking them to the well-examined relationship between photography and death. This article argues not only that the notion of the death selfie refers to the noema ‘ça a été’ introduced by Roland Barthes but also that, through a change of context, its interpretive possibilities are shifting from a snapshot to an object of a larger expression. Moreover, the paradigm of the unrepresentability of death needs to be discussed in relation to the selfie, as it relies on the tactile connection between the human body and the release of the camera. To consolidate these approaches, it is suggested that the selfie should rather be understood as a practice of memento mori in the context of post-mortem photography. The paper focuses on the widespread resurgence of the animated GIF in the contemporary mediascape. This outdated digital format’s current significance seems to lie in its ability to resolve the age-old dualism between still and moving images. The GIF’s looping structure is analysed as symptomatic of many facets of today’s online environment in relation to issues of embodiment, indexicality and desire. The GIF is investigated as an object of longing, a source of mirth, and a tool used to enrich online interactions. Finally, the performance of the self that it entails is interpreted as centred on the category of affect. The possibilities for recombination offered today by digital media tend to blur the boundaries between the stasis of photography and the movement of film. This redefinition suggests that photography no longer focuses exclusively on concepts such as instantaneity and stillness. The cinemagraph is a particular type of animated GIF that is almost entirely static, apart from some small details within the image that move subtly in an infinite loop. Its contemporary emergence seems closely connected with the present reconfiguration of the traditional categories of stillness and movement from the standpoint of interconnectedness and simultaneity. With the loop as its structural principle, based on repetition and brevity, the cinemagraph’s iterative operation generates an analytical experience that suggests that it is impossible to look at the image’s movement without simultaneously seeing its static ‘counterpart’, thus confusing notions such as instant and duration. The cinemagraph’s loop also implies an ‘archaeological’ concept of animation that affords the viewer an exquisitely ‘monstrative’ pleasure that transcends any narrative quality of the image, recalling the attractive compulsion to repetition of pre-cinematic optical toys. The digitalisation of photography has often been interpreted as a process of dematerialisation. However, empirical studies show that the material dimension is still fundamental to digital photographic practices. By accepting the argument that digitalisation prompted a reconfiguration of photography’s materiality, rather than its disappearance, this article examines a phenomenon that has developed on the periphery of, but relating to, digital photography: the reappropriation of analogue technology by ‘serious’ amateurs. By using data collected during a study on the reappropriation of Polaroid technology, this contribution traces some patterns in the reintegration of materiality within amateur practice, showing how photographers have redefined the role of objects as a reaction to the spread of digital photography. This essay examines the Here is New York project, a photographic exhibition that opened in late September 2001, just two weeks after the Twin Towers collapsed (hence, it was the first public event to provide documentary evidence of the 9/11 disaster in New York City). In particular, the essay spotlights two main aspects of the exhibition. On one hand, it explains why, during setting-up, the curators decided not to distinguish between professional pictures and those taken by amateurs (all the photographers present that day thus became eyewitnesses with cameras.) On the other, it underlines the significant discontinuity proposed by Here is New York, which adopts a very different visual rhetoric compared to the representation of 9/11 in the mainstream media coverage, especially by US television and major newspapers. This article analyses the construction of pain, as dramatization of suffering, in contemporary photojournalism culture. By studying three pictures, shot during different conflicts and awarded prizes by the World Press Photo Association, this contribution examines how the repetition of Western iconography ‘figural models’ – such as the mater dolorosa and the pietas – forms part of a dramatization strategy involving the photographic act. The persistence of a religious memory in photographed subjects’ poses and the implied photo-editorial choices reveals a non-neutral intentionality that forces us to question both the relationship between image-making and news-making and the dynamics of their propagation into a political strategy characterised by the necessity of humanitarian interventionism. This article examines the Lytro Illum, a ‘plenoptic’ or ‘light-field’ camera. This device captures information on the colour, intensity and angle of incidence of each incoming photon and uses that to reconstruct the three-dimensional environment of the scene in the frame. The output file is an image that is quite easy to navigate and refocus. This type of image derives from the hybridization of digital photography, computer vision and computer-generated imaging within the fast-growing broader field of computational photography. This article starts by addressing the Lytro’s theoretical and technological bases; more precisely, it highlights the Lytro’s place in the wider quest to develop a device that can completely recreate reality in digitalised form. The spotlight then shifts to two aspects of computational photography that are significant for visual theory: its relationship with the interactive effort of the human imagination (following PietroMontani’s idea) and its importance in the context of a broader theory of the sensors as basic apparatuses of enunciation. This paper discusses various points about the emerging forms of social communication and about the challenges to be faced because of the endless changes in digital society regarding web developments and the massive use of social media. Besides surveying some crucial aspects of the literature on social communication, including tentative attempts to define its boundaries, we focus on its role and its languages in the changing social and media context. In particular, we discuss how social communication with audiences can be more effective when “synchronised” with society and with the forms, formats and languages used by contemporary media. We mention some national and international best practices, chosen for their ability to synchronise and for their effectiveness in reaching their goals not only through innovative strategies and tools but also by adopting a media-neutral attitude strategically focused on ideas and creative concepts. One of the Swiss television arena’s most interesting characteristics is undoubtedly its linguistic, cultural and territorial make-up, due to its division into three macroregions: the German-, French- and Italian-speaking zones. Two significant phenomena coexist in each region. One is the cultural and linguistic proximity of foreign radio and television systems, whose channels are widely consumed within the Confederation, too; that applies both to public service networks (such as ARD, ZDF, RAI or France Télévision) and to their commercial counterparts (like RTL, VOX, the Mediaset channels, La7 and TF1). The other phenomenon is the strong presence of the public service broadcasting, SRG SSR, which in turn is structured into seven channels: three in German, two in French, and two in Italian. In the Swiss television system, the public service broadcaster has played and still plays an important role as a bulwark of the national identity. This article analyses the strategies used by RSI, the public television service in Switzerland’s Italian-speaking region, in acquiring and scheduling a kind of television product usually considered “global”: American-made TV series. The paradoxical hypothesis advanced is that public service television fulfils part of its mission, while resisting competition from the neighbouring countries’ channels, precisely by adapting and scheduling this “global” product. From the 2000s onwards, various social and technological events made photography more accessible, ubiquitous, public, cheap, democratic, immediate and shared than ever before, paving the way to a renewal of photographic experience. The editors of this issue, Adriano D’Aloia and Francesco Parisi, propose the term ‘snapshot culture’ to refer to the combination of technological, aesthetic and practical shifts in contemporary photographic scenario.